See more stunning applications in real homes and businesses in our photo gallery. 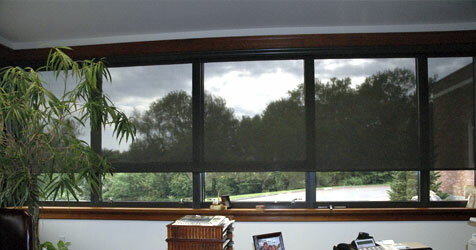 With Worldscreen's innovative design, your shade will never wrinkle or sag. Whether you want your motorized shade to block glare in the office or block daylight to improve video projection quality, our engineers have developed the shade solution you need. Options are the key. Worldscreen offers a wide variety of standard cassette colors made of extremely high-quality materials for both indoor and outdoor situations. What’s more, the innovative MicroCassette can be made with regular or reverse fabric roll direction to make sure your shades clear door handles or other architectural details. You have a choice of standard white, ivory, beige, bronze, or clear anodized cassette colors. Anodized finish can be custom-painted or wallpapered to match any decor. In short, we offer great fit, a great look, and great results. For examples of how our shades improve efficiency and aesthetics in commercial applications, click here.